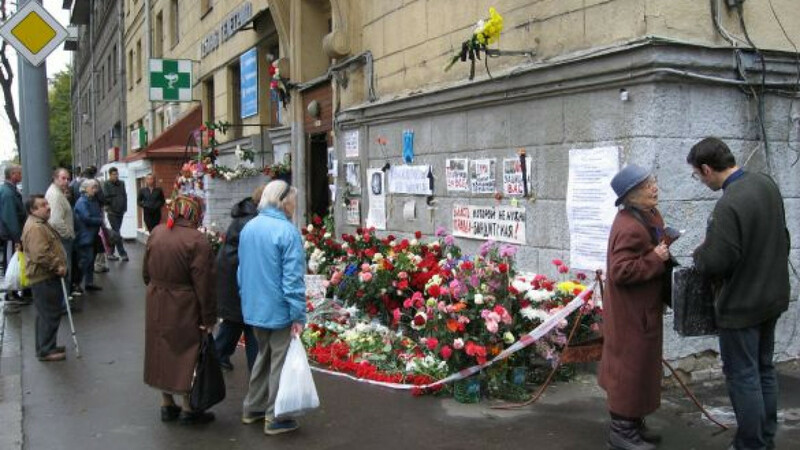 Muscovites pay tribute to Anna Politkovskaya outside her apartment building in 2006. Hours after refusing to grant permission for a picket in memory of murdered journalist Anna Politkovskaya, city authorities reversed their decision and caved in to activists' demands. "They unexpectedly called back and suggested we hold our protest on New Pushkin Square. They promised to grant permission," Alexander Cherkasov, head of human rights organization Memorial, told Interfax. Officials from Moscow's Central Administrative District earlier told Cherkasov that the whole of the city center would be busy Sunday, when organizers plan to hold the picket to coincide with the sixth anniversary of Politkovskaya's death. Cherkasov said authorities originally proposed moving the picket to a monument to Alexander Suvorov, an 18th-century Russian general, or a location on Yauzsky Bulvar, but that his organization rejected both options as unsuitable. Novaya Gazeta journalist Politkovskaya was murdered Oct. 7, 2006, in the apartment building of her Moscow home. She was known for critical coverage exposing corrupt officialdom and atrocities committed by Chechnya's Moscow-backed authorities. Her murder case has not been solved.